Photo Caption: Dr. Schwartz inspecting a soybean study in the Altheimer Greenhouse at the University of Arkansas. This year, my HuffPost blog posts are all about amazing women's college STEM alumnae. In the previous post, I wrote about a Wellesley College alumna, Lucia Perez, and shared her story as an aspiring astrophysicist. The next amazing STEM woman I'm introducing is Dr. Lauren M. Schwartz, a 2009 biology alumna from Sweet Briar College. Lauren's a Weed Scientist, and in 2015 she earned her Ph.D. in Plant Biology. Passionate about helping farmers reduce the number of weeds in their fields, she's already making an impact. She is recipient of the 2016 Outstanding Paper Award, Weed Science from the Weed Science Society of America (WSSA) for co-authoring, "Seedbank and Field Emergence of Weeds in Glyphosate-Resistant Cropping Systems in the United States," and it's exciting to see Lauren being recognized so early in her career. For those unfamiliar with agricultural practices, effective weed management is important to farmers, both here in the United States as well as globally. Farmers know that crop production is negatively impacted by weeds, and they want to learn how to prevent and manage weeds in their fields. During our conversation, I learned more about being a Weed Scientist and Dr. Schwartz's current position of Post-Doctoral Research Associate at the University of Arkansas. We also talked about what she likes best about her work and what inspires her. I study the population dynamics of weeds and herbicide-resistant weed species in agronomic crops (i.e., corn, cotton, rice, soybean). So basically, I set up field and greenhouse experiments to test how a weed species will react to a proposed treatment, which could be the use of herbicides, competition with other weed species, or an environmental stressor (fire, drought, flooding) for example. My days vary between the growing season and the off season. The growing season is essentially from planting to harvesting (typically late spring to early fall). During those days, we are planting fields, setting up our field trials, collecting data, maintaining our research areas, or harvesting. I tend to get up early, so that we can beat the heat in the summer, when we are working outside. I work in four different cropping systems: corn, cotton, rice and soybean. Usually, I am either conducting my own research or helping out another person in the lab with their research. Each day is spent in the field, working on various research experiments. During the "off season" I conduct experiments in the greenhouse, analyze data, and write manuscripts/reports on the experiments that we conducted that season in the field. I also help teach a class each semester and help mentor the graduate students in my lab. There are a lot of moving parts to my job. I love working with a large group of people with mixed backgrounds in STEM and collaborating on a daily basis. Each person brings something to the table that allows us to develop and carry out unique and exciting research goals. Field research is definitely one of my favorite things. It drives me every day to realize that I will never know everything that there is to know in my field. There is always going to be something new to learn or do. Working on the front lines of my field is exciting, and I want to try and learn as much as I can while trying to conduct research that will help others learn something new. Graduating from Sweet Briar College in 2009 with a Bachelor of Science degree in biology, Lauren's botany focus started in her junior year. Before then, Lauren planned on becoming a veterinarian. Her career direction changed sophomore year, as the result of a veterinary internship. Surgical procedures were part of the internship, and she quickly realized that surgeries were not for her. Knowing this would limit her career as a veterinarian, she decided to look for an alternative career. Fortunately for Lauren, she attended a college that took the time to help her in this process; women's colleges are known for a highly-supportive environment geared to the success of their students. Sitting down with her academic advisor, Lauren mapped out a plan for determining a new career direction. This resulted in Lauren embarking on a path not originally considered: botany. Lauren credits the professors and faculty at Sweet Briar College for rekindling a childhood interest in plants and flowers as well as guiding her as she considered other career options. Knowing this kind of individual attention is not available at all colleges, Lauren greatly appreciates her alma mater and wholeheartedly encourages all college-bound high school girls to visit the 3,250 acre campus in Sweet Briar, Virginia, regardless of study interest. Lauren graduated from college knowing that she wanted to attend graduate school for botany with a focus on ecology. She decided on Southern Illinois University, Carbondale and earned her Master's in Plant Biology. Here, Lauren studied invasive species in grasslands. This study opened the door to work on a co-advised agro-ecology project for her Ph.D., a joint project that also included the Weed Science Lab in the Plant, Soil, and Agricultural Systems Department. New to agriculture, Lauren soon discovered she enjoyed being involved in a project that leveraged her ecology background as well as expanded her field of study. 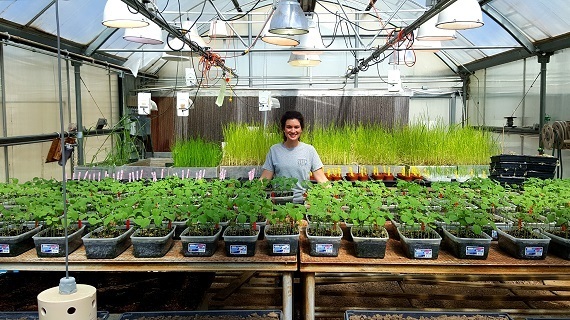 Her dissertation provided Lauren with an opportunity to integrate two fields not often integrated - invasive species in natural systems and weeds in agriculture systems. I loved hearing about the unfolding of Lauren's career. Now that she's established herself as a Weed Scientist, her career path has many options: work in academia, teaching at a college or university, or secure a research position with a company. Either way, her immediate career path is one of research. I hope you enjoyed reading Dr. Schwartz's story. More amazing STEM women stories are on the way, so stay tuned for future blog posts. And, if you would like to learn more about this project or be included, feel free to connect me via the contact gadget found on my blog, Advantages of a Women's College.